Looking for an easy way to track cryptocurrency prices? Try using cryptocurrency price tracker extensions! These extensions are extremely easy to use, because they are attached to your web browsers. Since they are extensions, you can quickly access them at any time while you are browsing the internet. Now what are some of the best cryptocurrency related extensions? Well, for your convenience, I’ve compiled a list of some of the best extensions available for both Chrome and Firefox. 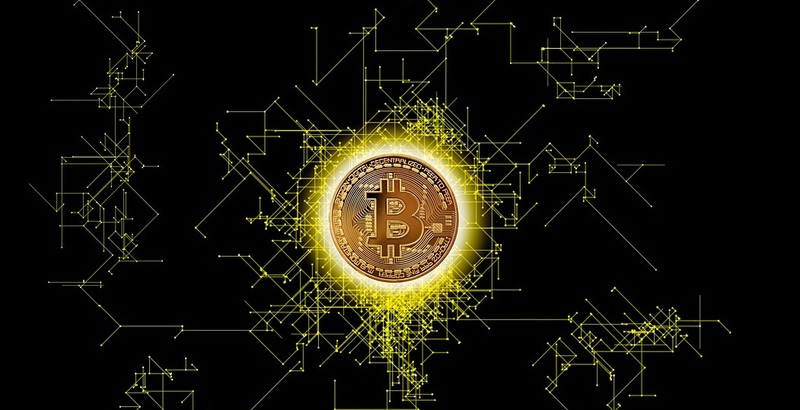 Hopefully, these extensions will give you an edge when it comes to making money off of cryptocurrencies. Chrome is the most popular web browser these days. Therefore, it is only natural that we start with Chrome extensions. It is important to note that since these extensions work on Chrome, you can use them on almost every type of platform. In other words, they will most likely work on Windows, Mac, Android, iOS, etc, as long as they have a Chrome browser installed on it. That’s the beauty of browser extensions. Okay, without further ado, let’s get started. Bitista is a lightweight Bitcoin exchange rates converter extension that not only works on the Chrome browser, but also on Firefox. Furthermore, there is an android version of Bitista that you can download for your mobile device. There are rumors that this cryptocurrency tracker will soon be available for the iOS and Windows systems. In addition, you have the ability to access all of the information online, if you don’t feel like downloading or installing anything. However, while Bitista is flexible it only shows the current price for Bitcoin. In other words, there aren’t any graphs or portfolios that you can use. You also can’t see the price of other cryptocurrencies. So, the bottom line is that this extension is ideal for people who usually trade Bitcoin in more than one currency. The user interface is both minimalist and easy to use. There aren’t any advertisements or anything, clogging up your screen space. It is a highly recommended extension. Next up the line is a more popular price tracker available for the Chrome browser called CryptoVision. As you can see in the picture above, it is highly convenient to track your favorite crypto coins. All you have to do is click on the extension and you will see live, up-to-date information of your coins of choice. One of the best things I like about CryptoVision is that it has a very easy to use system. 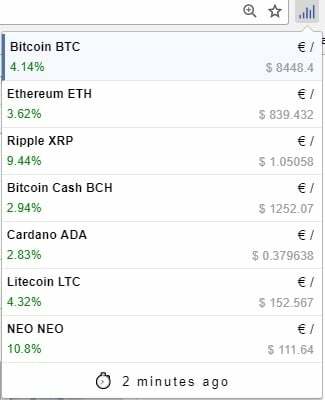 All you have to do to add a cryptocurrency to your portfolio or “watch list”, is to click on a button. Furthermore, you can drag and drop the coins to rearrange them. 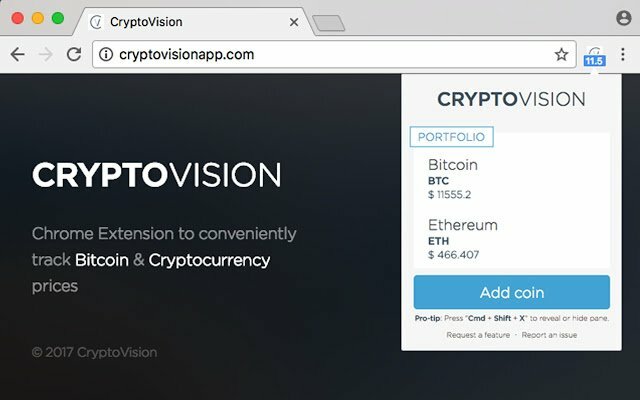 All in all, if you want an easy and simple extension to keep track of your coins, then I recommend CryptoVision. Okay this one is also quite easy to use. 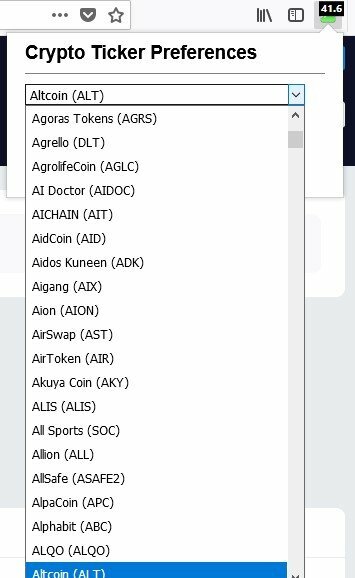 All you have to do to access your list of coins and their respective prices is to click on the extension. The prices are updated every 5 minutes and information is gathered from coinmarketcap. This extension also has an unique function that allows you to not only see the price in one currency but two. 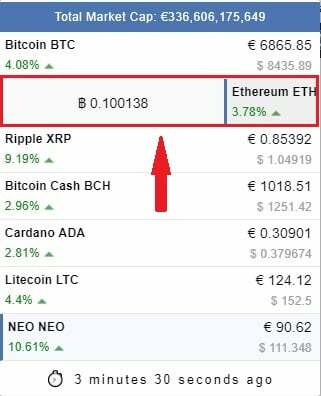 In other words, if you want to see the price of Ethereum (ETH) in let’s say EUR, then you will also have USD underneath it. You can see how it is set up in the picture above. In addition to the USD, you can choose to see the value in EUR, GBP, CNY, CHF, CAD, and AUD. You will need to change to currency in the options page. Remember, whatever currency you choose, the USD will always be there for convenient comparison. You of course also have the option to choose which coins are shown on the popup window. You have hundreds of cryptocurrencies to choose from, and more are added frequently. Select the coins you want to see in the options menu. You will also be able to compare any cryptocoin with Bitcoin. To do this , click on a coin in the drop down menu. Finally, there is a timer at the bottom of the pop up that indicates when the next update will happen. 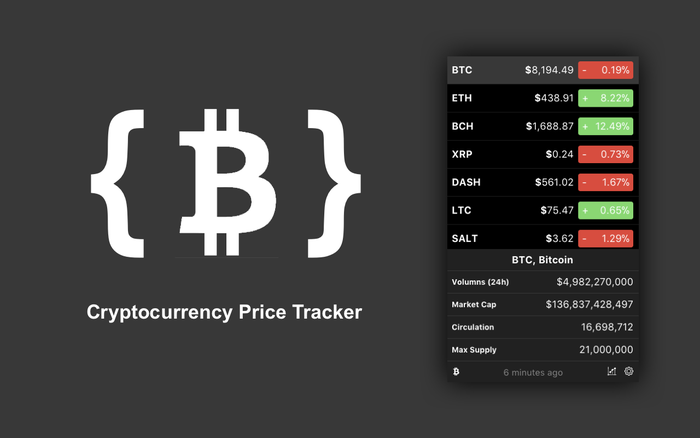 In conclusion, Cryptocurrency Price Tracker is one of the best extensions you can use for Google Chrome. I especially how easy it is to compare coins to both USD, other currencies, and Bitcoin. Firefox is also a highly popular web browser that can be used on multiple platforms. If you are a Firefox user, then you will find the list below helpful. This FireFox extension looks easy to use, but it is also packed with features. With this extension you can easily keep track of the prices of most of the major cryptocoins. You will also have easy access to other information such as Market Cap, Max Supply, circulation, graphs, and more. While you do have a limited amount of coins to choose from, you can also choose which coins are allowed to be seen on the drop down menu. Personally, I like the user interface of this extension. It has a “night”theme and is easy on the eyes. The extension also receives regular updates and maintenance. I recommend this Firefox price tracker extension for people who enjoy having flexible settings. The extra features on this extension also makes it ideal for more experienced traders. Crypto Ticker is an unique price tracker extension. This extension keeps things simple by showing the live update of only one cryptocoin at a time. However, the great thing about this is that you don’t have to click on anything to see the price of your favorite coin. Instead, the price of the coin is shown right in your FireFox’s toolbar. You can of course change which cryptocurrency you want to see. In fact, there are over one thousand cryptocurrencies you can choose from. As for fiat currencies, there are over 30 to choose from. Price changes are updated every minute. Who is Crypto Ticker ideal for? Well, this extension is great for people who like to browse the internet and keep an eye on their favorite cryptocurrency while they are at it. Obviously, since you can only view one coin at a time, this extension is ideal for individuals who only have invested in one type of coin. Honestly, not having to click on a button to check on your coin is a highly convenient feature. There you have it, the list of the best cryptocurrency price tracker extensions For Chrome and Firefox. The extensions aren’t ordered from the best to worst. All of these cryptocurrency trackers are great and it is up to you to decide which one fits your taste.